1. Remember to vote. Some legislators understand the issues that affect patient care and impact anesthesiologists more than others. We want to elect legislators who support our patient care. 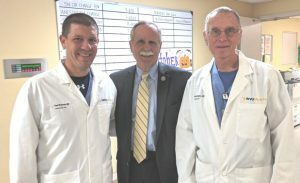 Below is a picture of Congressman David McKinley visiting the operating rooms at WVU Hospital last week. He sponsored the ASA-endorsed legislation on opioid control and research that the house and senate approved and the president signed last week. The congressman, a professional engineer by background, was particularly impressed by the technology we use daily – hand-held ultrasound devices, BIS monitors and non-invasive cardiac output monitoring. WVSSA legislative directors and officers can offer observations on candidates for the upcoming election to anyone wanting information. No increase in ASA dues for next year. Greatest debate occurred over a statement on the Anesthesia Care Team – primarily over how to medical direct student nurse anesthetists. It was ultimately referred back for further consideration. 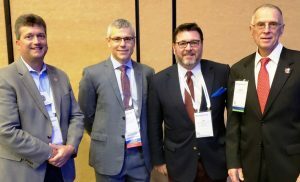 Educational products such as the ACE and SEE programs and services such as the Perioperative Surgical Home and Quality Institute remain as priorities. WVSSA representatives at an ASA House of Delegates meeting.